The original concept of this museum was put forward by Crown Princess Victoria of Prussia, who named it after her husband Kaiser Friedrich. The museum was known as Kaiser Friedrich museum for the longest time. It was opened in the year 1904, at the time when the concept of having a museum for high arts was not common. This differed a lot from traditional museums and like many other places was also destroyed during the second world war. After going through various stages of restoration, it was finally made into the way it stands today. Initially, this place had sculptures and paintings side by side and that was a very new concept for a museum back in that year. But today, it has works mainly from the Byzantine Art. Check official website for additional ticket prices. How popular is Bode Museum? People normally club together Alte Nationalgalerie and Friedrichstrasse while planning their visit to Bode Museum. An interesting little museum. There is not a lot of varieties here but it is still some impressive stuff here. One should arrange at least 2 days for museum island! Bode museum organized really impressive exhibition by comparing art between European statues and African statues. Audio guide included in the ticket. This idea is very creative and inspiring. The Bode-Museum is absolutely huge! For those interested in all forms of art, it's a must on Berlin. It contains so much to be seen, one can spend many many hours inside. Statues, paintings, coins, medals, mosaics, architecture - there's a lot of all of these at the Bode-Museum. 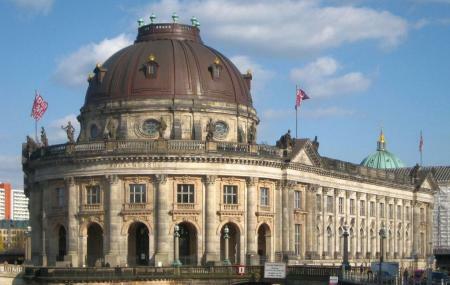 The Bode Museum on the Museumsinsel is the one you shouldn't miss on your tour. It's calmer than the other museums, letting you study the exhibited artworks without getting distracted. The complementing architecture is one of a kind. To be honest this is just a must go! A magnificent Museum to visit! Wonderful architecture & interesting artwork, sculptures & an ancient African section. A sensational experience back into the past. You would at least need a minimum of 4 hours to indulge your senses at this Museum! It was quite interesting. They showed art from Africa and Europe in different rooms. Then they try to compare both art. The art are mostly based on religion. Although it was interesting, I still found it underrepresented, especially the art from Africa. They only represent very few regions in this continent. In addition, I also expected to see more from the African arts but unfortunately they have very few things to show. The audio guide was very boring and I think he sometimes feels tired or bored when he made this speeches. I was not impressed.